The letter kicked-off with a proclamation that the writer supports William Whatcott, an anti-gay crusader who has an ugly habit of handing out offensive flyers at Pride marches. This was followed up with hateful slurs against gay and black people. The envelope had a curious return address written on it- the offices of the controversial and alleged “Neo-Nazi” newspaper Your Ward News. Far-left activists and their journalist friends jumped on the letter quicker than an attention loving politician on a TV news camera. It was perfect timing, just two weeks before today’s hearing on whether Canada Post was justified in banning the delivery of Your Ward News- the Torontoist went as far as to use a hoax as part of their analysis of whether YNW’s editor was the person who sent the letter. But there’s one question they didn’t ask- is it possible that the letter itself is a politically motivated hoax? This isn’t the first time Wong-Tam tweeted out hateful letters that were mailed to her, there are at least two other instances where she shared her hate mail during the last election in 2014. Both letters contained the same sort of hateful remarks. The first was posted on July 15, 2014. 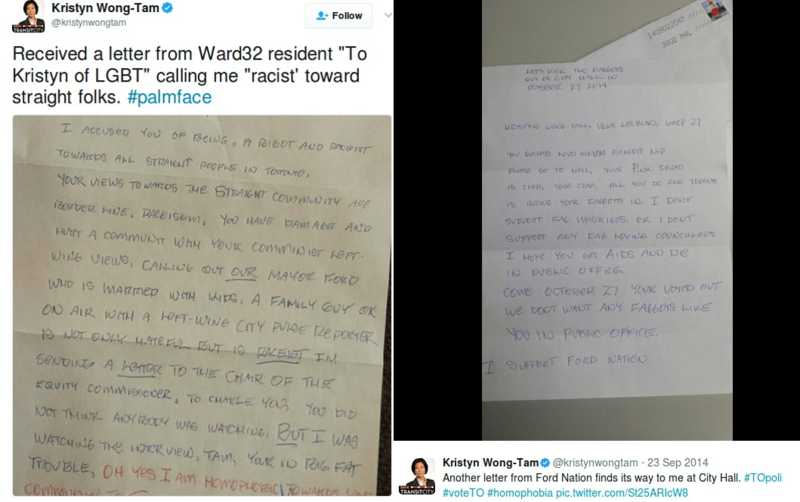 Wong-Tam described it in her tweet as a “letter from a Ward 32 resident”- rather presumptive, even if it was postmarked from within Ward 32 it doesn’t necessarily mean it was mailed out by a resident. The letter makes a bizarro remark about Wong-Tam being “bigoted and racist towards straight people,” and attacks the counsellor for “calling out our mayor Ford”. Wong-Tam tweeted out the second letter on September 22, 2014. 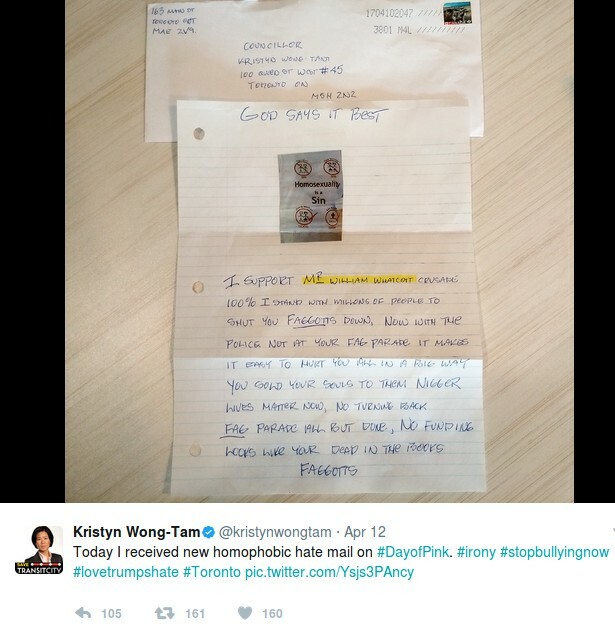 It was addressed to “Kristyn Wong-Tam ugly lesbian”. It was more hateful than the previous with derogatory comments about “faggots”, and the ugly comment “I hope you get AIDS and die in public office”. The letter closes off saying “I support Ford Nation”. After careful analysis of the three hate mails Wong-Tam tweeted out, it seems apparent that they were all written by the same individual. As shown in the above screenshots, the handwriting is pretty much identical. 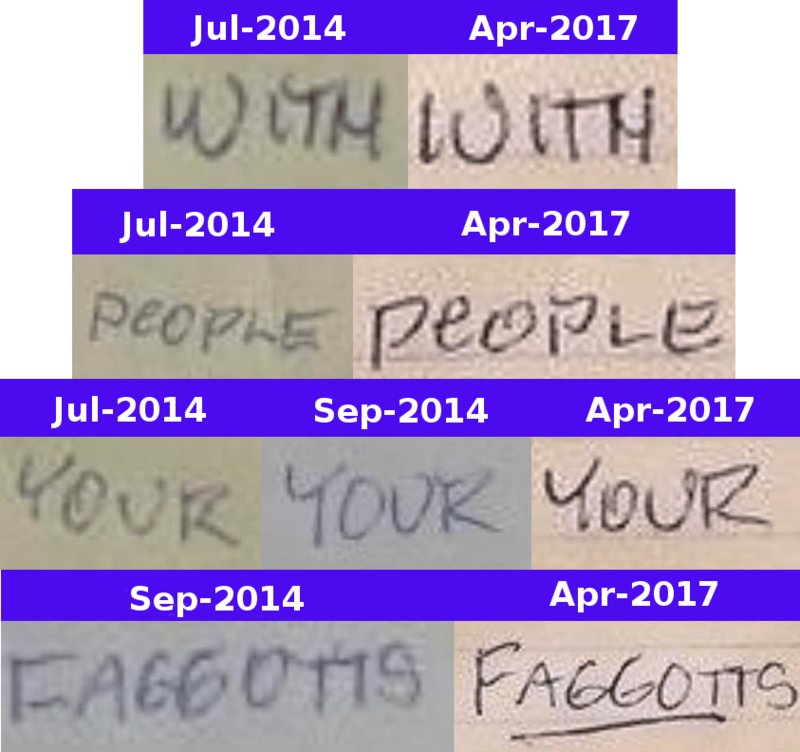 Other similarities include how the writer underlined words they wanted to empathise, and the common misspelling of the word “faggotts” (the proper spelling only has a single “t”). There’s also a commonality in the postmarks. The April 2017 and September 2014 envelopes share the same postal code “M4L”. Wong-Tam claimed that the July 2014 mail was sent from Ward 32. the “M4L” postcode appears to be in the same ward. 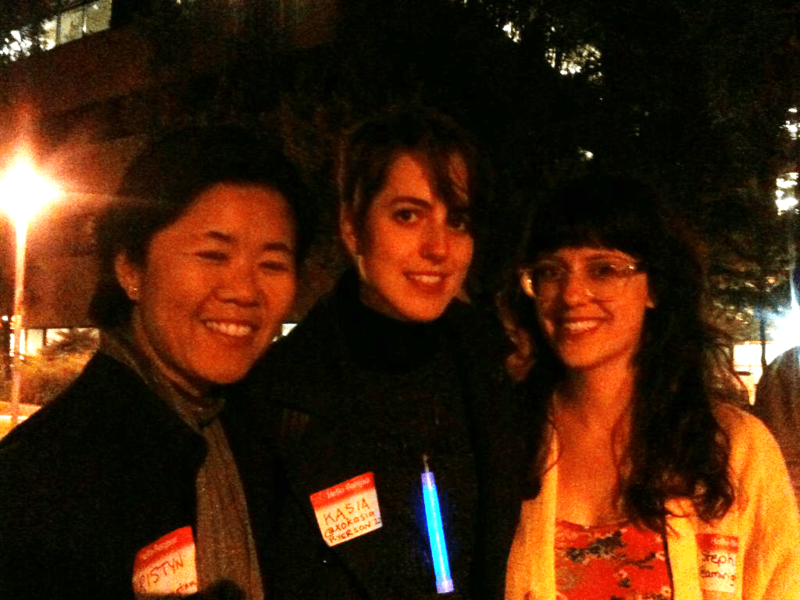 On May 30, 2012, Councillor Wong-Tam joined Councillor Shelley Carroll on a panel for the now defunct group Women In Toronto Politics. The purpose of the evening was to “explore how female players in the political sphere are discussed on Twitter, in the media, and elsewhere”. Of course, most reasonable people who are experienced with online communications will understand what’s wrong with this statement- the primary rule of dealing with Internet bullying is “don’t feed the trolls.” But Wong-Tam takes a different view on things, like with the above three letters, she takes an exploitative angle and uses this sort of incident as an opportunity for shameless self-promotion. Sitting in the audience was a young woman named Stephanie Guthrie. 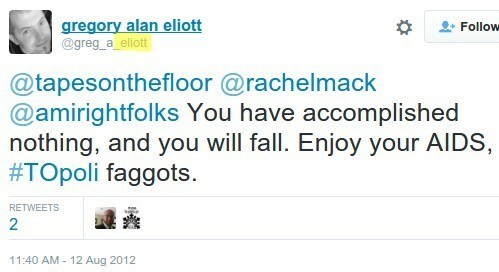 There was also a now well-known Internet martyr named Gregory Alan Elliott who spent over three years of his life defending himself from criminal charges after Guthrie and her friends swarmed him online and used their connections with the Toronto Police Service to file an incredibly flimsy charge of Criminal Harassment against him. Elliott was eventually found not guilty of the charges against him, and his trial brought worldwide recognition of the failures of Ontario’s justice system. But adding insult to injury, the judge nevertheless criticised Elliott for a hateful tweet he was alleged to have made saying, “Enjoy your AIDS #TOpoli faggots. Sounds a lot like the language in the letters to Wong-Tam, doesn’t it? Luckily for Elliott I noticed that something was wrong with the allegation he made that tweet- it was sent from a bogus Twitter account that was made to like it was his own. In an extremely abnormal hearing after his final ruling, the judge acknowledged that he made a mistake and made an apology. It didn’t take long after Wong-Tam’s tweet about the most recent letter for her allies to try and spin the story to give the impression the letter was written by YWN’s editor James Sears. The worst offender was Torontoist contributor Kieran Delamont. Delamont’s article used the letter as an opportunity to write a laundry list of the unpalatable aspects of Sears, a man whose publication is packed full of ugly content that pretty much includes something to offend everyone who isn’t a neo-Nazi. It’s fair to criticise YNW, I personally think most of their content is abhorrent. That said, Delamont stretched a bit far in his attempt- shamelessly trying to link Rebel Media (run by Ezra Levant, who’s Jewish) with a publication that’s regularly criticised for printing anti-Semitic content. Delamont’s lame attempt at making this connection would be outright hilarious if it wasn’t so ugly. 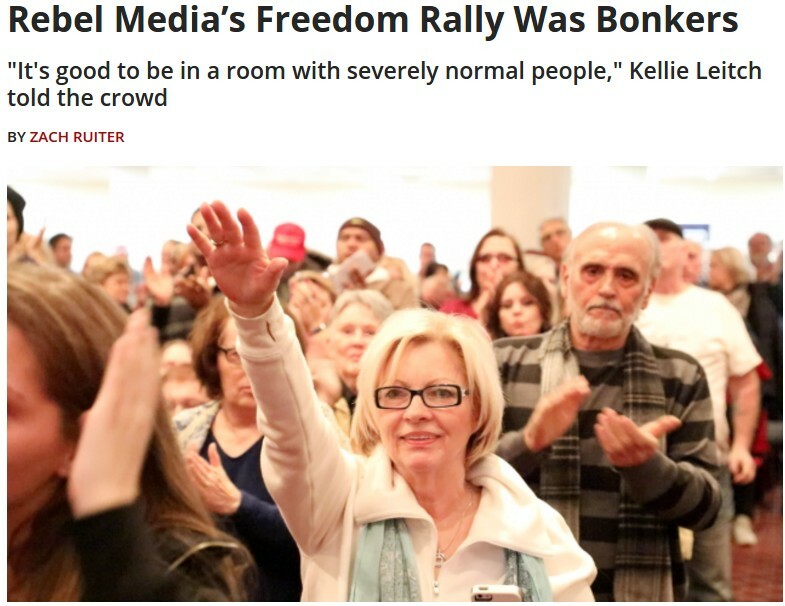 You see while trying to imply that Rebel is “white supremacist”, he links to another story by Torontoist contributor Zach Ruiter who tried to smear an evangelist Christian at one of Rebel’s events as a neo-Nazi. Ruiter made a disgustingly bigoted attempt to imply that the woman in the above photograph was making a “Nazi Salute”. She wasn’t of course, what she was really doing was an evangelist tradition of reaching her arm out to God. She was doing this inside of an evangelist place of worship- Ruiter’s accusation was as ignorant as someone ridiculing a Muslim worshipper for washing their feet before praying. So, Did Sears Write The Letter Or Was It A Hoax? This leaves us with the question of whether the hateful letters Wong-Tam shared with the world were genuine or if they were a hoax. Sears denies having any connection to the most recent letter and claims that it was a hoax, while Wong-Tam has been busy making claims the letters were written by “a Ward 32 resident” or someone from “Ford Nation- despite the fact she has zero evidence to back who really wrote them. 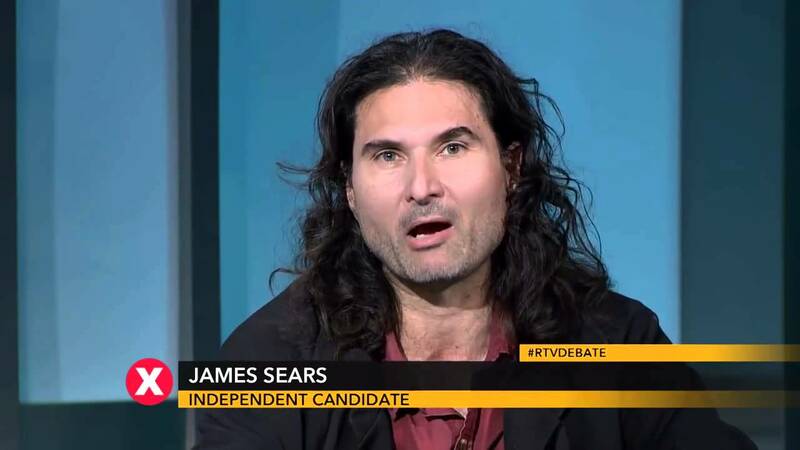 At this point, it’s just as possible that the letters are a hoax by James Sears as it is that they were written by one of Wong-Tam’s supporters in an effort to build political capital. Sears is a known trickster, and the timing of the letters (during an election and shortly before today’s YNW hearing) was very advantageous to Wong-Tam and her supporters. But the letters could also have just been written by some crank who’s trolling for attention. The only absolute we can take from these letters is that Wong-Tam needs to stop feeding the troll who’s sending them to her, and stop milking them to advance her political agendas. She’s supposed to be a role model, it’s time to start acting like one. use it for political theatre. It’s pretty obvious to me that these letters are a complete fabrication, not only because of the same hand writing, spelling errors, and postal code, but because of the content. They check off too many boxes on the politically incorrect and offensiveness “trigger” index to be genuine. So why are these letters always mailed to this councilor in particular, and no others? It seems rather odd. Why the remark about supporting William Whatcott? William Whatcott is an odd duck who prints up flyers and stuffs them into people’s mailboxes, if it weren’t for the Human Rights tribunal show trial, and the court case following it, nobody would know who he is. Whatcott is also a stand alone operator, he does not head or represent any organization or movement. Ironically his literature is permanently posted online as part of the public record of the courts, nice move SJW jackasses! I’m not sure if this applies to municipal politicians, but in terms of letters sent to provincial or federal politicians, it’s apparently illegal for such politicians or their staff to share the content of such letters with the media. They can share them with the police if they are sending specific threats of violence, which these letters do not, insults are not threats. I think that we might be witnessing a public case of Munchhausen syndrome here, a mediocre municipal politician who is fabricating an enemy in order to draw sympathy or attention to herself.